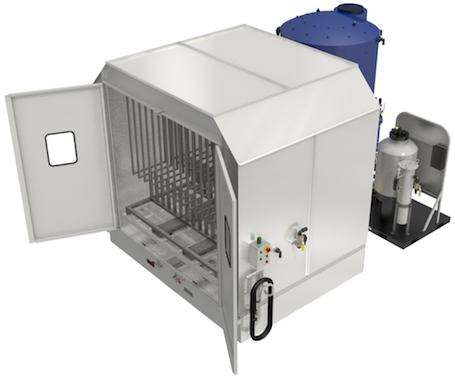 You have invested in a burn-off oven, complete the process with a Riveer wash booth. 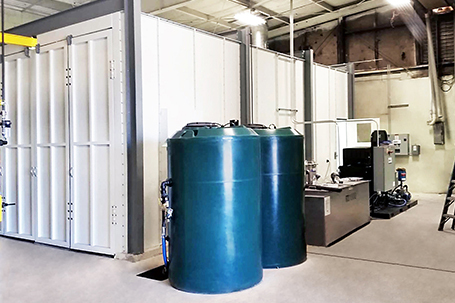 Self-contained so the washing process won’t negatively affect the surrounding facility environment, these booths are designed to spray wash and contain ash and provide comprehensive secondary cleaning associated with the burn-off process. Engineered to accommodate burned-off racks, fixtures, and hooks, the operator simply loads the wash booth cart, and rolls it into the booth. After securing the door(s), the ash coated fixtures are sprayed clean and the ash is contained and captured for disposal. The high-pressure jets provide complete coverage. Part loads be detailed by hand using the manual spray wand. The process recycles the water being used for wash sequence. 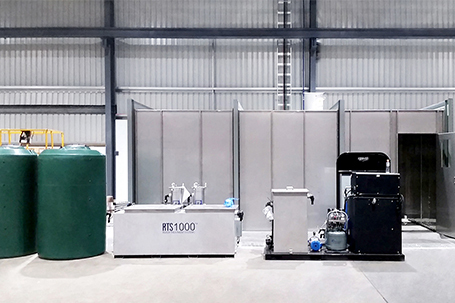 What sets the Riveer Ash Wash Booth apart from the others is our comprehensive ash and debris recovery system. Sprayed water and particulate matter are channeled through a robust filtration system that separates the ash particulate from the water, where it can be easily removed for proper disposal. The treated water can be safely disposed of through appropriate wastewater infrastructure. This integrated recycling helps you meet the most demanding environmental requirements while giving your facility the best possible parts washing solution.